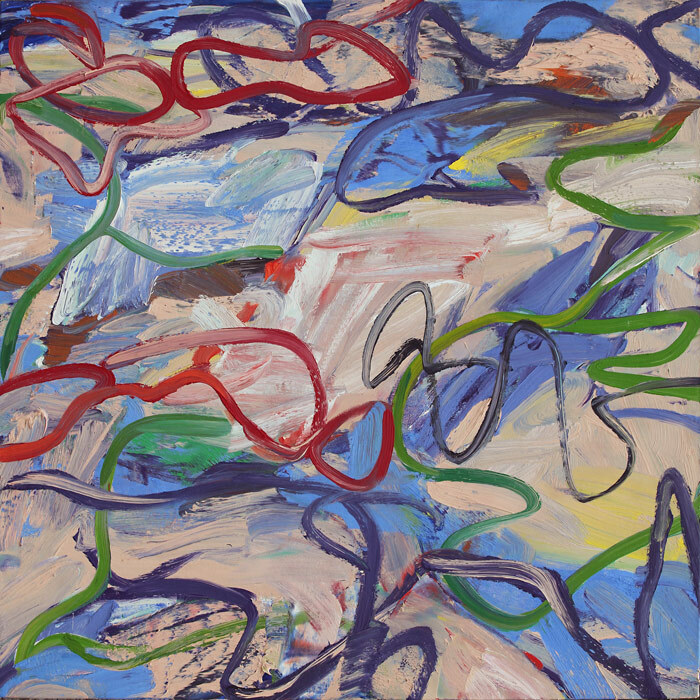 "New Work," an exhibition of paintings by internationally recognized artist Hugh O'Donnell opened on May 26, 2012 at Morrison Gallery in Kent and continued through June 24th. O'Donnell's work is held in museums around the world, from The Metropolitan Museum of Art in New York to the Tate Gallery in London. The new exhibition consists of paintings on canvas and wood from the "Green Age Series," which continues O'Donnell's development of a biomorphic symbolic language. This language incorporates an extended range of compositional elements that punctuate the space of the paintings. Polymorphic forms explore visual rhythms seen in nature, but instead of realistic vines or branches, we see free abstract acrobatic visual elements repeat, dance and climb through the paintings. The historian Dore Ashton places O'Donnell as one of the most significant inheritors of the New York School. She writes: "In O'Donnell's painting, over-riding golden ellipses and darting obbligatos of black line bespeak the artist's sense of freedom. Such a freedom is the one beyond the 'five and country senses' Dylan Thomas describes, and the one that the abstract expressionists craved." Hugh O'Donnell has exhibited regularly since 1975 with one-person and group shows. Public venues have included: Solomon R. Guggenheim Museum, NY; The Metropolitan Museum, NY; The Museum of Modern Art, NY; Addison Gallery of American Art, Andover MA; Aldrich Museum of Contemporary Arts, Connecticut; Museum of Contemporary Art, San Diego; Polk Museum of Art, Florida; Rose Art Museum Massachusetts; The National Gallery of Australia, Virginia Museum of Fine Arts The Royal Academy, London; The Walker Art Gallery, Minneapolis; The Museum of Modern Art, Kyoto, Japan; XLII Venice Biennale, Italy; Hirshhorn Museum, Washington DC; IV Medellin Biennial, Colombia, and of course, the Morrison Gallery, Kent, CT. In addition to painting, Hugh O'Donnell is also a site-specific artist working in a variety of digital media. Recent commissioned projects have been developed as motion graphic video walls spanning a distance of up to thirty five feet wide, excerpts of which can be seen at this exhibition. Currently O'Donnell is developing a motion graphic video for the Mohegan Sun Casino's, 56 monitor, one hundred foot wide video wall situated in Uncasville, Connecticut. A Professor of Painting since 1996 at Boston University College of Fine Arts, School of Visual Arts, O'Donnell's careers as a professional artist and as a teacher have become intertwined. The two practices are grounded in a study of nature, and in particular, growth dynamics. The artist lives in Washington, Connecticut and Boston, Massachusetts.